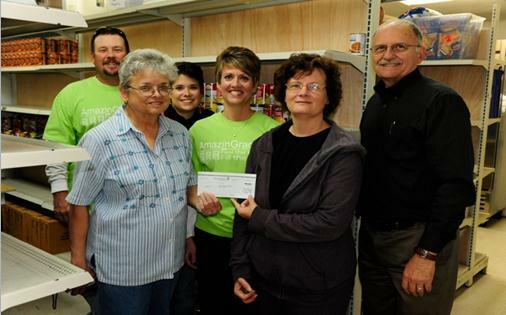 Emmanuel Baptist Church and Modern Woodmen presented a check for $5,200 to Appalachian Outreach last week, to support AO’s community food pantry. The money was raised at Emmanuel’s annual AmazinGrace 5K run, held October 7, and matched with a grant from Modern Woodmen. Pictured from left are Jeanette Huffaker, Modern Woodmen; Jean Ann Washam, Director, Appalachian Outreach; and Emmanuel Baptist Pastor Sonny Strange, In back are Bryan Miller, Karen Smith and Libby Miller, who organized the race.